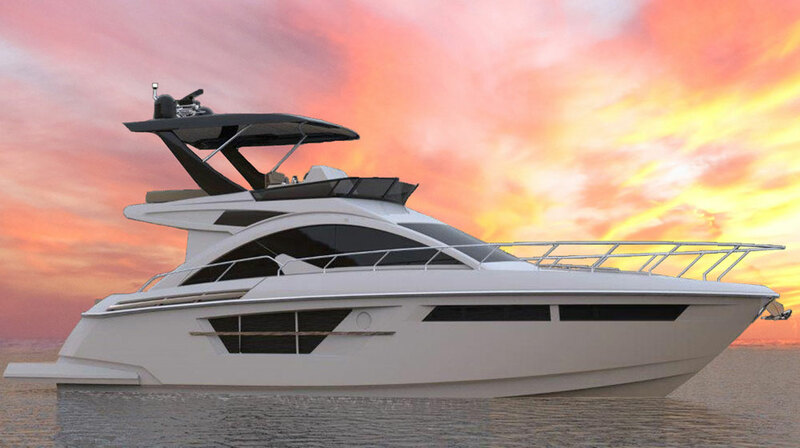 The 2018 Cruisers Cantius 42 breaks new ground for this luxury sport-cruiser builder. 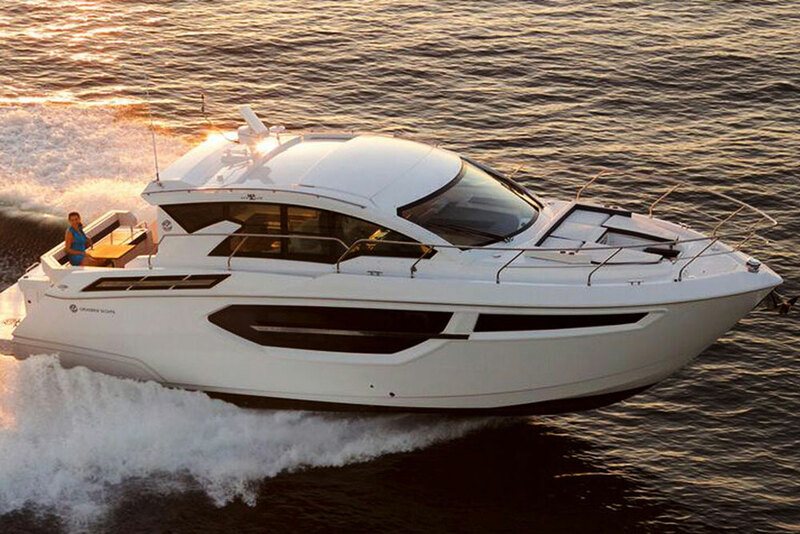 The Cruisers Yachts Cantius line influenced boat designs world-wide, beginning with the introduction of the original Cantius 48 way back in 2010. Followed by the Cantius 41, the Cantius 45, the Cantius 54, and the flagship Cantius 60, all of these models have followed one simple theme: Maximize interior natural lighting with windows and glass doors all around, and bring that light below-decks with an “atrium” style companionway to the lower cabin. And while the new 42 holds true to these two design traits, the cabin is also completely different from all others in this line. Curious? Check out this First Look Video we shot at the 2017 Fort Lauderdale International Boat Show, to find out why. Considering how successful the entire Cantius line has been in the past, why would Cruisers ignore that old adage “if it ain’t broke, don’t fix it”? Because as time goes on and boats change, people change the way they use them. One of the big changes we’ve seen among boats of this genre and the boaters who use them is a transition to cooking meals outside, on electric grills. That’s one of the reasons the Cantius 42 houses a grill in the transom. And by shifting the dinette into the aft end of the cabin and at the same time utilizing the huge opening provided by those sliding glass doors, the dinette is essentially connected to the cockpit, with its own exterior settee and dinette. Suddenly, you can create an indoor/outdoor party zone with seating and dining space for the entire crowd. Plus, you have easy access to the burgers and dogs the moment they come off the grill, as well as easy access to the indoor galley and its refrigerator full of chilled beverages. As expected and as is the norm for all Cantius models, even inside the cabin you’re treated to sunlight and salt breezes via a huge electrically-opening sunroof. 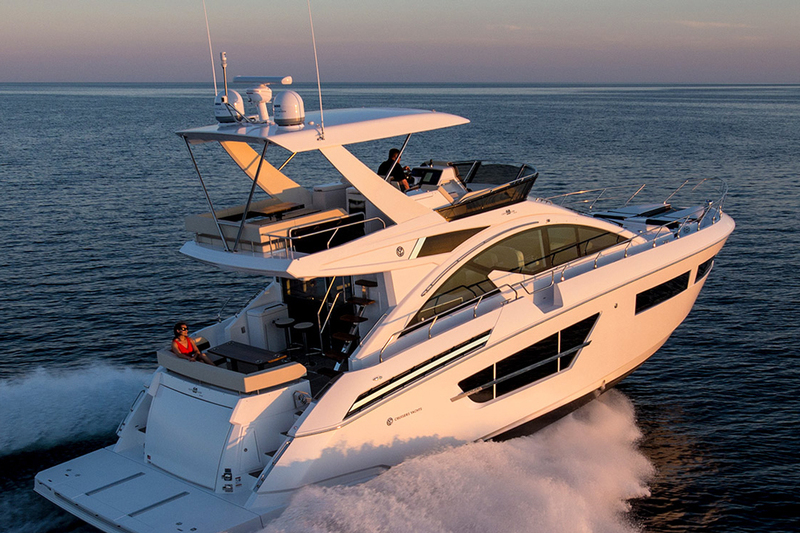 But another surprise for Cantius fans lies to port across from the double-wide helm seat, where on other models you’d have found the dinette that the 42 shifts aft. Here, Cruisers has created a combination forward-facing seating (best for use when the boat’s in motion) and an aft-facing lounger (best for when you’re kicking back and relaxing at anchor). 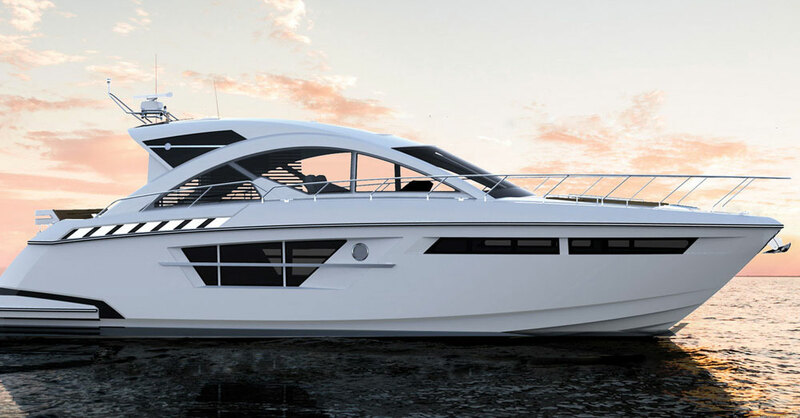 The Cruisers Cantius 42 certainly shares many traits with its Cantius brethren, but the layout has some features that are quite unique, too. The lower cabin isn’t too different from those found on other models in this line-up. Transition down the mini-atrium—it’s a bit smaller than on its bigger brethren, a natural result of the boat’s more compact foot-print—and you’ll first spot a forward guest stateroom with a pedestal queen berth, hanging lockers, and of course plenty of ports and windows to ensure copious natural light belowdecks. The master is a full-beam, which is a bit unusual for boats of this size though certainly not unheard-of. That means you get windows on both sides and a surprisingly large berth. Yet another surprise you’ll have down here is discovering that both staterooms have their own heads (the guest’s is separate and does double-duty as the day-head). On a 50-footer you expect that kind of privacy, but on a 42’ boat, not so much. There are even separate social areas to be enjoyed in privacy in the great outdoors, on the Cantius 42. Yes, of course the cockpit is one of them. 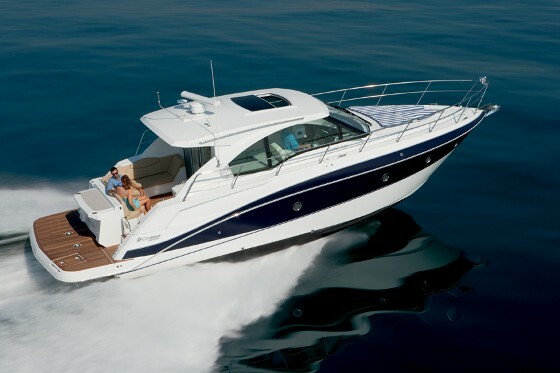 But Cruisers also utilizes the bow with the addition of a small but comfortable and functional cushioned bow cockpit. It’s mostly limited to fun in the sun for two, with a pair of loungers and cupholders, but even that is more than one usually expects to find in a boat of this size and nature. Yes, that is a (small) cockpit up on the bow – one that cruisers creates without sacrificing cabin space, the usual cost of adding a cockpit up front. The 42 was locked in tight at the boat show, so alas, we weren’t able to take it through the inlet and give the boat a full-blown sea trial. That said, Cruisers sticks with some very basic parameters when it comes to performance, and assured us that it’s no different with the new 42. The first is the use of Volvo-Penta IPS pod drive propulsion, in this case a pair of 370 HP IPS 500 powerplants. This ensures easy dockside handling thanks to joystick control, as well as rather sporty performance. And since these are the exact same powerplants used in the Cantius 41 (which we have tested and have performance numbers for), we can make a pretty solid estimate of cruising speeds in the mid 20-knot range, and a top-end in the low to mid 30-knot range. Just how comfortable will you be, hitting these speeds in the open ocean? 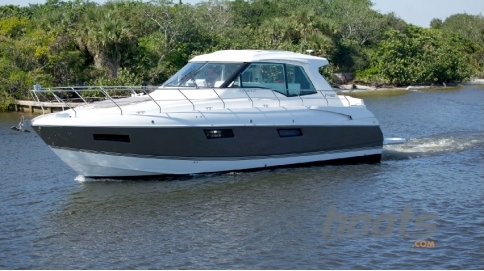 As a rule of thumb Cruisers Yachts provide a solid ride, and we expect it to be no different in this model. There are two reasons why: first off, the Cantius line is based on the same deep-V hullform (which, by the way, was one of the first ever designed specifically for use with IPS pod power), and second, Cruisers constructs these models with forethought and heavy-duty use in mind. A tour of the Cruisers factory proved this point. While there, we saw various models in different stages of construction and noted several important boat-building techniques being applied. We saw stringer systems bedded in polyester bonding material, the use of isophthalic laminating resin (which is more durable than many other types), hull-to-deck joints bonded all the way around, and liners bonded with methyl-methacrylate adhesives (commonly sold as Plexus—the same stuff they used to attach the heat-protective tiles to the Space Shuttle). A tour of the engineroom in the 42 also proves quite educational. You’ll see extensive use of top-end building materials like stainless-steel, cushioned clamps, and raceways that protect wiring and hoses. You’ll also notice that all of the plumbing, wiring, and through-hulls are clearly identified and marked, so future maintenance chores will be as easy as possible. On top of that, filters and maintenance access points for the engines are all easily accessible. 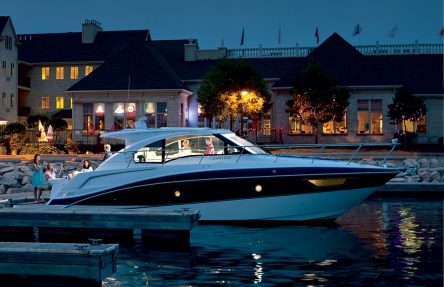 With the introduction of that 48 Cantius, Cruisers Yachts proved it was a ground-breaking company. Since then we’ve seen their design imitated in numerous boats, built by numerous companies. And if Cruisers wanted to lay on its laurels it could have easily rolled out a new Cantius that was merely the old design in a different size. But they didn’t. Instead, an examination of the new 42 proved beyond a doubt that Cruisers is still breaking new ground—and is adapting to the ways people want to use a yacht, rather than forcing people to adapt to the designs that are already out there. Other Choices: Boat shoppers interested in the 42 Cantius will also want to check out the Tiara 44 Coupe, which places the master stateroom in the bow and the guest amidships. An option with similar accommodations but in a more traditional package can be found in the Hunt 44 Express Cruiser. 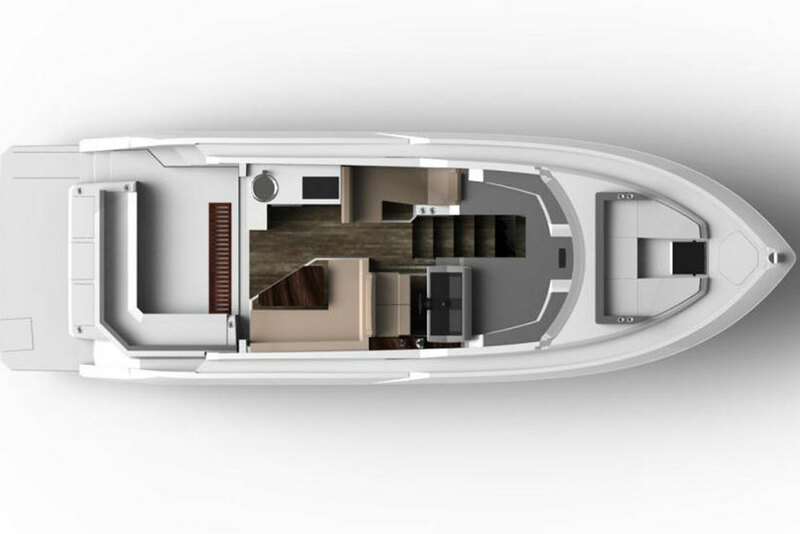 And slightly smaller options that still support a two-stateroom layout would include the Beneteau Gran Turismo 40, and the Sea Ray 400 Sundancer.